From heavy blues to heavy metal, the SH-4 JB Model from legendary manufacturer, Seymour Duncan, boasts tones from warm to raw rock 'n' roll. This pickup comes in a black colour. The JB model has become an archetype hot-rodded humbucker for over 30 years. This model comes in a black colour. From heavy blues to heavy metal, this pickup works a charm. These pickups boast uses by famous players including Paul Stanley (KISS), Gary Rossington (Lynyrd Skynyrd), Ty Tabor (King's X), Steve Marker (Garbage), Nick Hexum & Tim Mahoney (311), John Connolly (Sevendust) and Dave Mustaine (Megadeth). The Seymour Duncan SH-4 JB Model provides pounding output whilst retaining singing highs, aggressive harmonics, and a right blend of sustain and distortion. You can play warm tones at one point and then drop into raw rock 'n' roll. The SH-4 is a versatile pickup with stronger treble detail than the SH-14 Custom 5, and it comes with a four-conductor hookup cable. Works Great in a Pair! The SH-4 JB Model pickup is recommended for the bridge position. It pairs nicely with the SH-2 Jazz Neck pickup if you're looking for versatility or with a SH-1 '59 for P.A.F. tones. 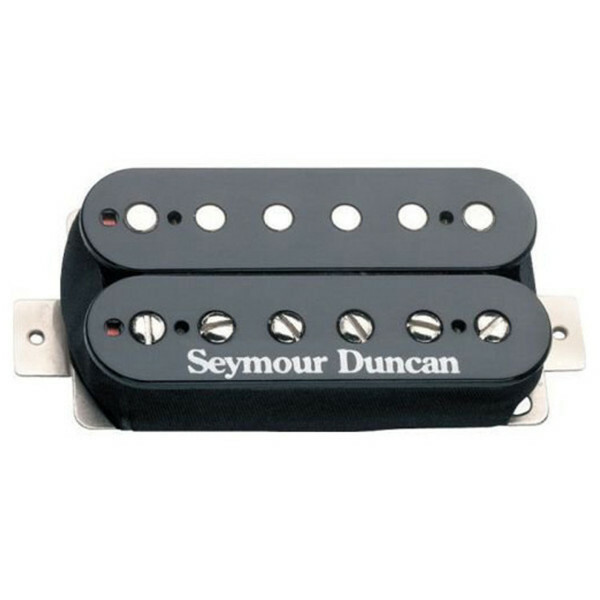 This pickup works great with balanced and warm instruments, especially guitars with rosewood fingerboards.